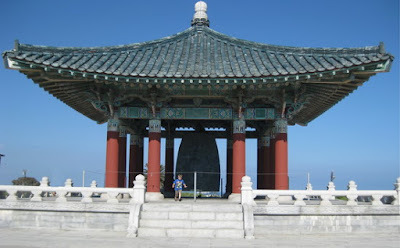 I've lived off and on in the Los Angeles area for several years but have never made it up to the Korean Friendship Bell. Today was the perfect day for it! High on a knoll in San Pedro with Catalina Island in the distance rests the Bell and Pavilion placed there in 1976 as a lasting monument of friendship between Korea and the United States of America. Ben enjoyed running around the actual Bell, as you can see above. It was such a beautiful day with ocean breezes cooling the air, families spread out watching the cruise ships coming into port, and kids flying kites. 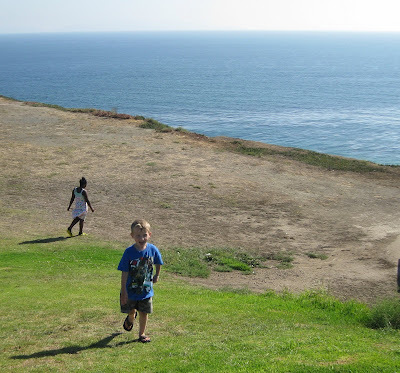 Benjamin particularly enjoyed running up and down the grassy hill. He'd pause to say he was out of energy, take a breath, and then race off again.